Sharing great reads. One book at a time. What is The Reading Experiment? Where will you be on this day in 20 years’ time? More importantly, who will you be with? 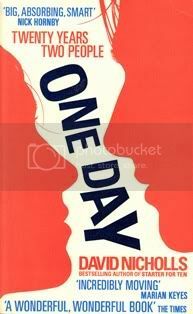 One Day by David Nicholls tells the story of Emma and Dexter, who hook up on their last night of university before going their separate ways. The book charts the highs and lows in their friendship over the next two decades, revealing one day in their lives – 15 July – each year. Author David Nicholls also writes for film and television and One Day will hit the big screen in 2011. His TV credits include the third series of Cold Feet, and One Day has a similar feel. He creates detailed characters and a growing sense of anticipation in One Day – will they or won’t they? Emma loves Dexter and Dexter might love Emma…but then again, he loves all women and has a very short attention span. Will Dexter ever get his act together? Or will Emma get fed up and move on? Relationships aside, One Day is also a reflection on the major life events that shape our 20s, 30s and beyond. It’s sometimes funny, sometimes sad and instantly familiar. Thank you to Soph for recommending this book to me. *Please note: You won't pay any more if you buy this book via these links, but they will give me a small referral fee (5%). Thank you for being part of The Reading Experiment. Happy reading! read it, a little cliched but a good sunday afternoon read. Thanks for your comment l.e - I agree it's a good Sunday read. The Reading Experiment. Theme images by Deejpilot. Powered by Blogger.